The West Rand region of Gauteng encompasses the towns Carltonville, Krugersdorp, Westonaria, Randfontein, Soweto, Western Gauteng, the Magaliesburg and all their surrounding areas. All of the aforementioned towns, each of which used to be a separate municipality, have been incorporated into the new West Rand District Municipality. The whole area has grown and developed as a direct result of the discovery of gold in the area. A greater part of the West Rand region is rural and includes some of Gauteng's most beautiful scenery. To the West of the region are the Magaliesberg and Witwatersberg mountains and the valleys of the Skeerpoort and Crocodile rivers. In this area are the archaeological diggings in the Sterkfontein Valley, now known to be the cradle of mankind. The Magaliesberg range has seen the establishment of numerous hotels, guest houses and resorts along its entire length. In the Eastern part of the range is to be found the Hartbeespoort Dam, a Mecca for the weekend holiday maker from Gauteng and home to many different watersports. The mountains offer many routes to rock climbers and details can be obtained from the Mountain Club of Pretoria. Hot-Air ballooning and hang-gliding are also carried out in the area. There are a great many attractions in and around the village of Magaliesberg. There is a fish farm, a trout farm, the Buffelspoort Holiday Resort, antique shops, a game lodge and the Rhino and Lion Nature Reserve, steam train rides and art galleries. Muldersdrift is a picturesque small village situated at the foot of the southern slopes of the Magaliesberg Mountain range to the West of Pretoria. The village is surrounded by small farms and smallholdings and has become a center for a great number of home craft industries and artists. Close to Muldersdrift in the West Rand is the Lion Safari Park where visitors can see many different species of wild life including a number of prides of lion in a central fenced area. Situated close to Muldersdrift is the Bella Vallata 4x4 Playground, a 5 km off road track specifically built to contain every type of obstacle likely to be encountered by a 4x4. This 4x4 track is a must for 4x4 owners and braai facilities are available. Close to Muldersdrift can be found the Sterkfontein Caves and the Cradle of Mankind. Sterkfontein was declared a World Heritage site in 1999. Just to the West of Johannesburg lies the Lanseria International Airport, a general Aviation airfield that first started to take shape in 1972. Lanseria Airport is ideally situated for corporate jets traveling to Johannesburg or Pretoria and has recently been modernized. The larger towns of the region owe their very existence on the presence of gold in the area. Gold was first discovered in the West Rand in the 1930s. A mining engineer from the Gold Fields Mining Group, Guy Carleton Jones, after whom the town of Carletonville was named, played a big role in the discovery of gold in the area. Krugersdorp is another West Rand town that offers a great variety of leisure options including the Krugersdorp Nature Reserve with its lions, rhinos, hippo & buffalo, giraffe and at least ten species of antelope and buck including the rare roan and sable antelopes. 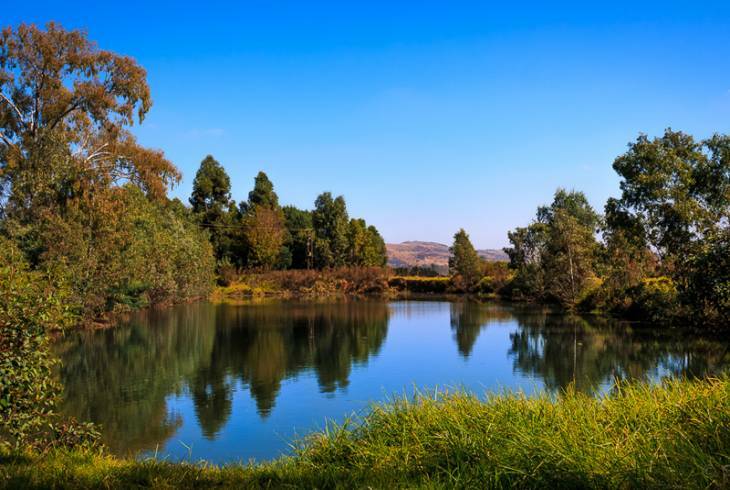 Just a few kilometers to the North of Krugersdorp is the Kromdraai Conservancy. This area is underlaid by dolomite rock and has many caves and sinkholes. The region is an unparalleled treasure trove of anthropological finds including the earliest authenticated man-made fire. The conservancy houses a number of attractions including a trout farm, the Wonder Cave, a gold mine and a Lion Park. Mokoya Lodge is a cosy country venue in the Hekpoort valley providing superb settings to create memorable Mokoya experiences. Offering 17 cottage style (on-suite) bedrooms on 27 Hectares of bush. Onze Whonen guest house in Carletonville is a charming 4 star rated Bed & breakfast facility that is centrally situated & is within minutes of the worlds deepest & richest gold mines. Jackal Hill is situated on the Magalies Meander about 15km from Magaliesberg. Stunning views of the Magaliesberg Mountains, less than 3 km's from Askari Big 5 Game Reserve, two Micro Breweries in close proximity. Restore and revitalize your soul in our secluded spacious "wooded" bush environment and connect with nature. The Eco Retreat self-catering home in Hekpoort is nestled between the Magaliesberg and Witwatersrand mountain range along the Magalies River. Turtle's thatched cottage and Badger Lodge are situated on the tranquil estate and both of our cottages offer a truly relaxing experience for the romantic couple, family or party of friends. At Patrys Paradys we welcome both the romantic couple who prefer the solitude of farm life, and the group of friends or family who needs a place to come together to strengthen that special bond. Get away for a romantic weekend, spoil your sweetheart in our fully- equipped units on the banks of the Magalies River to enjoy the peace and tranquility of the Mountain, while relaxing and unwinding from the stresses of daily life. Pet and Child Friendly Self Catering Accommodation. Stone Hill has 10 fully equipped luxurious self-catering timber cottages, accommodating from 2 to 6 guests each. West Rand Accommodation and Information. West Rand, Gauteng.